Worse – much worse. I have absolutely nothing to do this afternoon so I shall spend time putting my thoughts down on paper – in time I may be seen as the Pepys of the twentieth century. I have never been much of a one for religion but I thought I would take a stroll along the front to St Aldhelm’s in time for Matins. 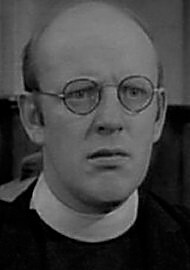 That blasted verger, Mr Yeatman, who caused so much trouble in the Home Guard days, met me at the church door. He was handing-out hymn books as though they were death warrants. I felt it was time I announced my return to Walmington and marched smartly along the aisle and sat in the pew at the front. A sharp tap on my shoulder proved to be from Mr Rees who, in a highhanded manner, told me that the pew was reserved for the mayor and his family if they should choose to come. I told him that we are all equal in God’s eyes and would have gone on to say a few words about the mayor showing humility in God’s house when we were interrupted by a violent wheezing noise. I thought at first that an elderly member of the parish was expiring in the back row, and was just wondering how good my Home Guard first aid training had been when the wheezing was joined by warbling tone and the congregation commenced singing Immortal, Invisible, God only wise. It is such a dreary dirge of a hymn, but I piped-up and endeavoured to put a bit of backbone into the feeble congregational singing. The vicar, who was now standing in the pulpit, led the singing in a reedy voice and a look of intense suffering – as though our efforts offended him. After the hymn had finished and we had indulged in a bit of kneeling and mumbling of platitudes he started his sermon. He took for his text the parable of the prodigal son. I find this tale of a tiresomely irresponsible youth who swans-off with the family fortune to return with his tail between his legs decidedly irritating. If I’d had a son like that I would have had him working in the fields – never mind all that fatted-calf nonsense. I don’t know if it was my imagination or not: as the vicar warmed to his story of the profligate irresponsibility of the youth I’m sure the kept glancing at me. When he finished his homily with a resounding, if smug, call for the forgiveness of sinners the verger most definitely looked me straight in the eye with a complacently superior look on his face. After the service, as we lined-up to shake hands with the vicar I made up my mind to go on a tour of inspection of the town – with the intention of drawing up an itinerary of items to present to that insufferable old bore Mr Rees for some action. The town hall railings need fixing for a start. However because I had sat in the front pew I was the last to leave the church and that fool Farthing tried to engage me in conversation: he asked how I was, and enquired after Elizabeth (I dodged this question to avoid embarrassment). He rather impertinently asked if I had anything to do at the moment and must have interpreted my pause (in which I was articulating a concise summary of my plans) for indecision. He grasped me by the shoulder and before I knew it he was leading me into the church hall. It was very strange – I had not been in St Aldhelm’s Church hall since that night in December 1944 when we fell-out for the last time. It looked exactly the same – the wooden floor polished and swept. The same pictures of Their Majesties hanging either side of the doors, the same smell of beeswax and damp. But although it looked the same it felt like a different place. When we paraded there was a sense of urgency and threat. The hall was our centre of operations, almost one of the platoon Now it seemed just a hollow shell – a place for bible classes and rummage sales. And it was precisely the latter that confronted me as I entered the hall. Row upon row of trestle tables being laid out and heaped high with all sorts of rubbish. One of the Misses Godfrey (I forget which) catching sight of me bustled over bearing a very large plate on which stood a very small bun. It would have been impolite to refuse, though the thing looked dry and unappetising, and so it was. The rationing is worse now than it was in forty-five when I left and I would judge there was very little fat or sugar in the leaden thing. I enquired after her brother, Charles – I must confess I had feared the worse as he was very frail in the last days of the Home Guard, and eventually we had to give him a permanent first aid post in the hall just so he could remain near the conveniences. However it seems that his spirit is undefeated, though he has been laid-up for the last few months with a rather severe case of lumbago. Miss Godfrey tells me he has taken to jigsaw puzzles with great enthusiasm which have seen him through a rather trying time – Though where he gets them I can’t imagine. So I promised to pay him a visit next week. I was not altogether clear of the vicar’s motives in bringing me to the hall and rather feared he hoped to get a donation for the church roof fund – which in my current situation would have been highly embarrassing. It was a relief – though, as it happens, only a slight one – to discover that his motives were not pecuniary. It seems that there is a most terrible developing problem with ex-servicemen who, deprived of their uniforms, their billets and their incomes have become homeless, and without employment – often taking to drink and crime as a result. I would have thought that the lessons learned fighting to bosch would have taught these men a little discipline and self-reliance. On the other hand it is typical of this socialist mob we have for a government to abandon the men who fought for their country while pursuing their grandiose Bevanite dreams. So when the vicar told me that the church is raising money for an ex-servicemen’s appeal fund – hence the rummage sale – I was not unsympathetic. What he sought from me was a little of my flair for organisation and leadership that got us through the war years, but which now seems to be in such short supply in Walmington. In short I have been offered the chair of the Walmington-on-Sea ex-Servicemen’s Relief Fund. I have accepted, but with reluctance. On the one hand I am not sure that my personal plans will allow me too much time to spend on committees. On the other the cause is such a good one that I really cannot refuse. The first meeting will be on the afternoon of Thursday next. Fooling around in the church hall like that meant that I was unable to take my tour of the town as it was almost lunch-time. Consequently I returned to the guest house where Mrs Gippings greeted me gloomily and served me with the smallest, driest lamb chop I have ever seen, two over-boiled potatoes and a grey sludge which purported to be some sort of cabbage. I do think this rationing has gone beyond a joke. When Hitler was just the other side of the channel I could understand it – the shipping was disrupted, our farm hands were all in the army, and there was no metal to make machinery. But the war has been over for three years now, and still it seems impossible to buy food, clothing, furniture, or practically anything else. When I think of the meals I used to get in India I wonder why I ever left. It’s high time someone sorted it out – we should never have got rid of Winston, that’s when the rot set it. Having eaten my meagre lunch, and conscious that England is more than ever in need of men of vision and ability, I set out to inspect the town. It was not possible in the time available to review the whole town, so I confined myself to the major public facilities: the promenade, Victoria Park, and the town hall. And so I find myself in possession of a sorry catalogue of dilapidations, evidence of slip-shod workmanship, and the general impression of a job being very poorly done by the town authorities. Having written my diary for today I shall now set to compiling a letter to the town clerk’s office detailing my findings and recommending some action to be taken immediately. This entry was posted in diary on January 11, 1948 by wolAdmin.